One of the boldest tartans ever, clan Buchanan! The Clan Motto: Clarior hinc honos, “Brighter, hence the honour”, just like the tartan. Clan Buchanan can be traced back as far as the 11th Century when Anselan O Kyan received the lands of Buchanan, east of Loch Lomond. Some of the septs of this ancient clan are Colman, Gibson, Gilbert, MacKinley, MacCormack, Masterson, Morris and Watson. Aye, lad, “Walk proudly” in this bold tartan kilt! Just found your site. Looks Great! Cool tattoo! Gibson is a sept of Clan Buchanan for those that don’t know. I bought the Sport Kilt to wear while lead hikes at the Family Nature Summit in Maine/New Hampshire this Summer in July. I have worn it working out in the gym, I’ve treated it with permethrin for ticks, and it should work out great! It is very comfortable and the pockets I had put in will be great for some small things that I need to carry while hiking. Kilt Perfection and Save Money!! 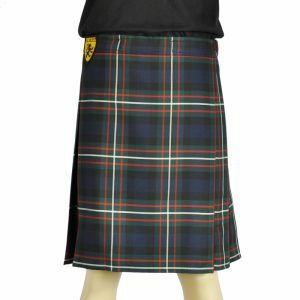 Ordering my Buchanan Kilt from the Sport Kilt folks was one of the best deals I’ve encountered. The kilt fit, ease of putting it on, and the excellent colors of the Buchanan tartan are perfect (I’ve stopped wearing my other kilt which I paid $600). The ordering process, delivery and follow-up have been terrific. I highly recommend ordering from Sport Kilt. Great Job and Fast delivery… Perfect! I wore this kilt to a fireworks celebration on July 4th. The weather was brutally hot, but I was extremely comfortable all day. Getting several compliments on the great looking kilt didn’t hurt either!